It was only a few days ago that Microsoft announced that it would be by partnering with Dell, HP and other companies to support its Surface Pro tablet, and now they’re collaborating with Apple. Whilst talking about the new iPad Pro at the annual Apple unveiling event, Apple’s chief marketer Phil Schiller welcomed other developers onto the stage to help demonstrate how it can help with workplace productivity. Needless to say the audience were left speechless when Corporate Vice President for Microsoft Office, Kirk Koenigsbauer walked on stage. 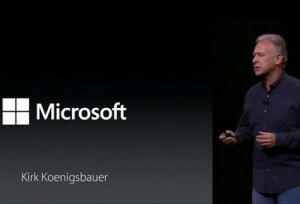 The brilliance of Koenigsbeauer’s appearance was his refusal to acknowledge perhaps how bizarre his presence was, merely demonstrating the new version of Microsoft Office on the iPad Pro, and simply stating that it was “a thrill to be here today”. Having been in competition for well over 30 years now, Apple and Microsoft have had a colourful history including a $150m investment in Apple by Microsoft, a high profile lawsuit and various other public spats. After a tumultuous decade that has involved Apple surpassing Microsoft in terms of Market Capitalisation (PCs still outsell Macs however) , Satya Nadella, the Microsoft CEO, seems to be taking steps in the right direction to turn the company’s image around and start to make more connections, even if they are with rivals in the marketplace. The reaction to this collaboration has been generally well received, with online bloggers stating it was a sign of peace. 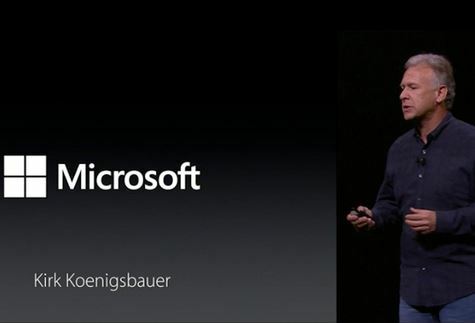 We have to give it to Microsoft however, after Apple CEO Tim Cook had once stated “”Our competition is confused. They’re turning tablets into PCs and PCs into tablets” in reference to the Surface Pro, it was pretty big of them to show support during a presentation of Apple’s own version of the Surface Pro, maybe Microsoft weren’t so confused after all! What do you think of this new collaboration? Let us know in the comments section below.